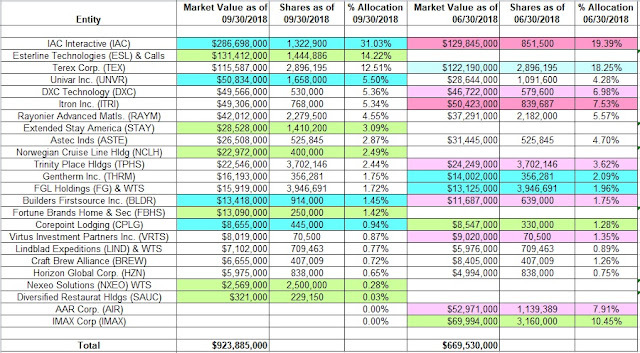 Mick McGuire’s 13F portfolio value increased from $670M to $924M this quarter. Marcato Capital Management added Esterline Technologies (ESL) while increasing IAC Interactive (IAC) and Univar (UNVR). They dropped large stakes in AAR Corp (AIR) and IMAC Corp. (IMAC) as well during the quarter. The largest three individual stock positions are IAC Interactive , Esterline Technologies, Terex Corp (TEX) and they add up to ~58% of the portfolio. Mick McGuire’s 13F portfolio value increased ~38% from $670M to $924M this quarter. Recent 13F reports show ~20 individual stock positions. The top five stakes are IAC Interactive (IAC),, Esterline Technologies (ESL), Terex Corporation (TEX), Univar Inc. (UNVR), and DXC Technology (DXC), and they add up to around ~69% of the 13F portfolio. Note: In September 2017, McGuire said he expects Terex Corporation shares to triple although it had already doubled since he first invested in July 2016. Shares were trading in the low-40s at the time. It currently trades at $29.90.